TWBN Trusted Partners is an exclusive program that represents a network of professionals with extensive experience in the bridal industry. They are reputable photographers, vendors and professionals who we trust to be ambassadors to our network. Their work is usually featured on our blogs and they have access to our advertising partners and bridal audience. 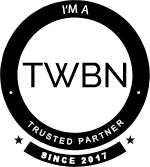 Only our trusted partners have been authorized to display this badge on their website.